“While doubt has been cast on the truth of the story, there are other accounts of it besides that of Herodotus. Diogenes Laertius says that Xenophanes, who lived in the same century as Thales, was impressed with the prediction, and he also gives additional testimonies from the pre-Socratics Democritus and Heraclitus. 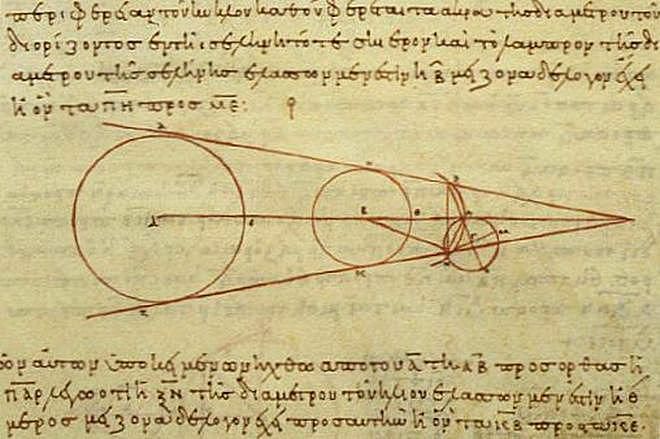 … If the account is true, it has been suggested that Thales would have had to calculate the timing of any eclipse by recognizing patterns in the periodicities of eclipses. It has been postulated that Thales may have used the Saros cycle in his determination, or that he may have had some knowledge of Babylonian astronomy” Panchenko, D. (2004). “Thales’s Prediction of a Solar Eclipse”. JHA. p. 275– If this is the case, we have an earlier Greco-Babylonian exchange of knowledge of celestial prediction than is usually accepted. Contact with the Medians (today’s Kurds) would have given him an opportunity to learn star lore from the Persians and Babylonians, if not the Medians themselves. At what must have been approximately 4.17 PM. the sky suddenly turned dark as the Sun was eclipsed by the Moon. The warring parties took this as an omen that the heavens commanded peace. The battle and the war ended on the spot. I managed to recreate the time of the eclipse for the specified location. This has more than one function. Not least is the doubt that the eclipse occurred on the specified date. See this rebuttal to Panchenko. The eclipse is well into the last degree of Taurus. This degree is referred to by a few names, the best known is the Anarectic degree. It is the degree in which the Sign is said to be exhausted. In effect, the sign is ended and the transition to the next is about to take place. Venus is the Lady of the Eclipse. How fitting this appears to be at the end of a war! It is as if the eclipse spelt out the end and the fighting turned to awe and mutual surrender. 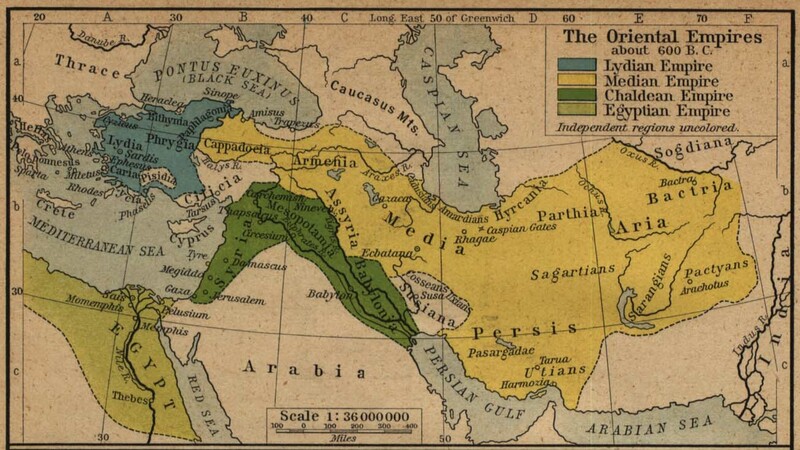 The sight of the eclipse precipitated an unexpected and immediate ceasefire between the Lydians and the Medes, who had been fighting for control of Anatolia (modern-day Turkey) for five years. Both sides of combatants interpreted the eclipse as a sign to reconcile. More often than not, eclipses have been seen as either a harbinger of some form of evil or a judgment of some sort. The latter would be a case such as an eclipse that occurred prior to the death of Richard III in the War of the Roses. 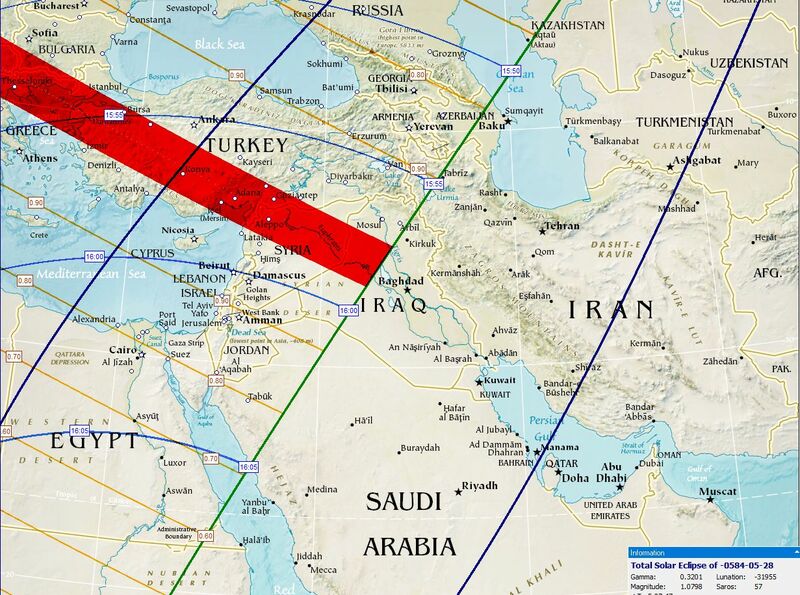 According to NASA, .in a solar eclipse, the Moon’s shadow falls across the Earth in a relatively narrow path, and the maximum duration of totality at any given place is often about 7½ minutes. However, the duration of eclipses is usually taken as the length of time between the first sight of the eclipse to the last, which includes all phases of the eclipse. This is not helpful and is often virtually impossible to reconstruct in the case of a historical eclipse. The astrological community, past and present, either makes no mention of either magnitude or duration, often making a vague suggestion that it might last for about six months or so. To begin with, this doesn’t take into account the relative strengths of mutable, cardinal and fixed signs. To be fair, many astrologers who make such claims are only interested in natal astrology and not mundane. One of the clearest and most plausible guide was published by Sam Bartolet in a booklet “Eclipses and Lunations in Astrology” and has an introduction by Llewellyn George. My copy is showing signs of advanced age, but I believe the publication may still be available by special order. Bartolet states that with regard to predicting the period of influence, or indeed when the effect will be noted at all, is a year for every hour of the eclipse. This is impossible for obvious reasons, so I take it that this is a typographical error (its typed by hand) and that minutes and not hours was intended. Please note that I do not imply an influence of the eclipse, except for the initial shock, but instead consider all celestial events as signs. In the case, of the Eclipse of Thales, the effect was virtually instant. 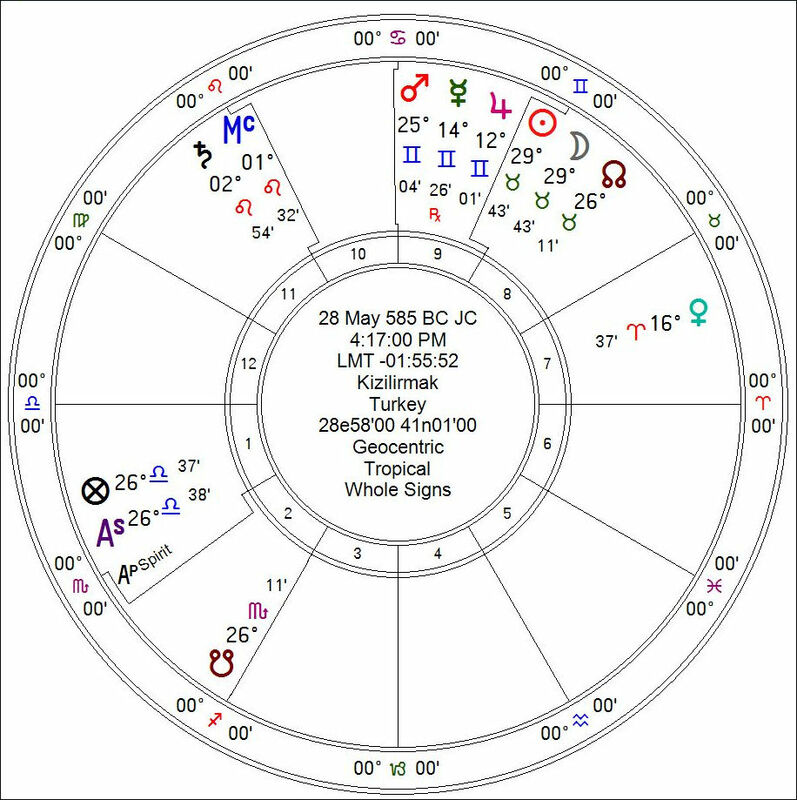 The fact that the eclipse was in a Fixed Sign and third decan of Taurus, which is sub-ruled by Saturn would auger for a longer period of influence. Nevertheless, there appears to have been a civilizing effect and seven years after the eclipse, we have events such as the building of the Ishtar Gate and throne room wall from Babylon, Iraq is made. The Hour is Saturn and the Almuten is Venus. This all seems to tie in well with the events of day.- a mighty judgement resulting in peace!